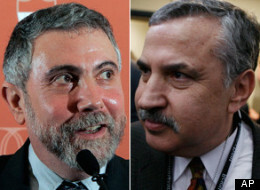 Krugman is right that Friedman is usually wrong. And not just about the national debt and the federal budget deficit. Despite the new technologies, the world isn’t flat. The story of the Lexus and the olive tree is only relevant today if we begin fueling Lexus cars with olive oil as an alternative source of energy. Now, Friedman wants to compare debt with global climate change? Is he for real? Unfortunately, Friedman is “for real,” all right, as in a really nosy blowhard masquerading as an intellectual journalist. He’s made himself a multimillionaire taking parts of half-baked ideas and turning them into books and generous speaking fees. Friedman’s the ultimate symbol of our style-over-substance age, emblematic of our decline as a culture. While Friedman may see himself as more serious than Malcolm Gladwell and on par with Jared Diamond, he is neither that good at exploring an idea nor that talented or thoughtful as a writer. David Brooks, for all his vapid neo-conservative kookiness (and now with his new “Humility” course at Yale), doesn’t always see himself as the smartest guy in the room, above the fray of everyday humanity. Friedman, on the other hand, often sees himself as the smartest guy in the Western Hemisphere, and among the top three when he travels to India or China. That is why, if or when climate change produces a mini-Ice Age, I will gladly gather Friedman’s books and columns and warm my hut with them.